In hopes of not jinxing it, I think I'm back on the sketch-a-day bandwagon. Here's today's sketch, and yesterdays. 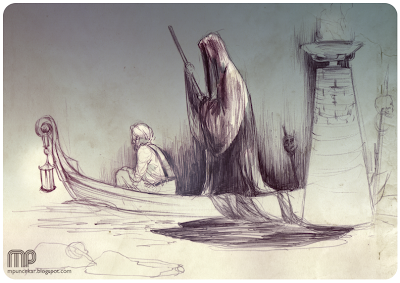 The boat one is random with no real story behind it. Just another pen sketch with me trying to shove more environments in. The second is part of a set of studies for me Illustration Seminar class with C.F. Payne. 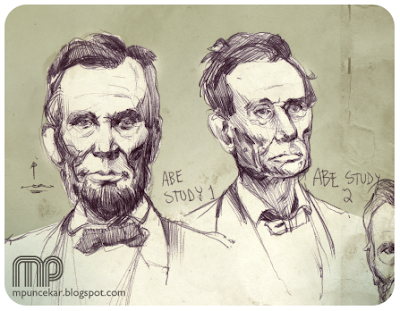 Have to do a straight forward illustration of a president, leaning towards lincoln because his deep set features fit my style of oils quite nicely, and he is weird looking. Although I keep asking myself why I got something so straight forward. Bit jealous of some of the other assignments given out. Need to work on likenesses anyway. Bit of a rant here though, this isn't complaining for the teachers that read this, but I think it's sort of ridiculous that I have three classes requiring sketchbooks to turn in. As a senior illustration major, I hate being baby-sitted this way. I mean, at this point it's a no brainer to keep a sketchbook, but being graded on it seems a bit ridiculous. In total I have to keep four sketchbooks this semester including sketch-a-days with different requirements for each. I'm all up for sketching, but all it does is force you to back off on portfolio building which I SHOULD be doing this year, making all these new assignments impeccable. Instead I'll be shaving hours off of each one because I have to go do life studies. It's the silliest requirement I've ever heard. If others don't think they have to keep a sketchbook, they can regret it later, instead of making me do all of this now. Nice Lincoln work, but c'mon... throw a bone to a president that never gets any attention, like Chester A. Arther;) just kidding. Actually I got specific instructions not to do a relatively unknown president, coincidentally. I totally agree about the sketchbook thing-- I have to do 4 as well, and it feels distracting from building a good portfolio. Granted, I'm on the track to graduate a year early so having a lot of work is to be expected, but still... I'd rather just put it on the back burner. I suppose one benefit of all this would be to show a good sketchbook to an art director-- I hear they like to see sketchbooks as well as polished portfolios. But it would lose its impact if it was all regimented and the sketches were just answers to required prompts. Aye, but watch your drawing skills grow! I totally agree that it will make you a better artist. Skill in our respect is additive and you just continually add to your own artistic skill with every mark. I just think it's silly that it's required. I was in such a habit of carrying my sketchbook everywhere I went I took it to a 9-5 job for a year before I realized I was never going to draw in it at work. I love drawing Lincoln. He has such an awesome face! Here is the last illustration of the bearded wonder i did.